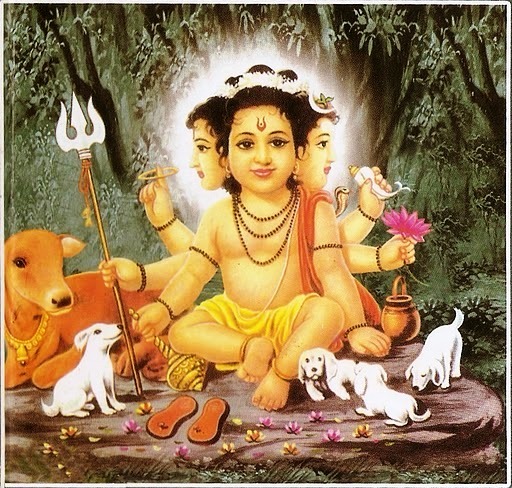 Adhyay 4 - Birth of Shri Dattatreya. Anasuya was the Devoted Wife of Atri Rishi.She was well-known for her Pativratya.Lord Indra got afraid of her Power and Prayed Trimurthy to Save them all as Anasuya may anytime win Heaven.Trimurthy in the disguise of Mendicants went to Atri-Ashram ,when Atri Rishi had been out to the River for Daily Rituals. 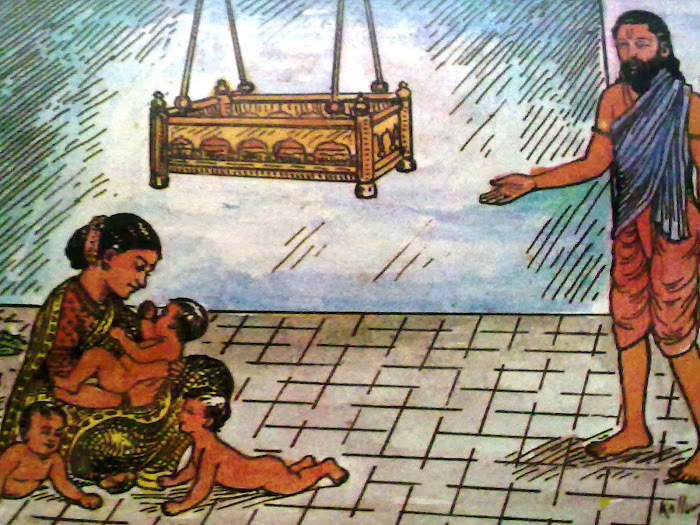 The Mendicants demanded alms and said that She should serve in Naked.Anasuya thought that They are Like my Children and went to Serve.Instantly the Trimurthy got transformed into Three Newly Born Babies.Atri Rishi returned to Ashram and realised that they are The Trimurthys.Anasuya asked Trimurthys to remain there as their Sons.Brahma was called Chandra,Vishnu as Datta and Shiva as Durvas.Later Chandra and Durwas went away for Penance.Shri Datta Stayed with Anasuya. Thus the Adhyay describes the advent of Sri Dattatreya as the son of Mother Anasuya and sage Atri. 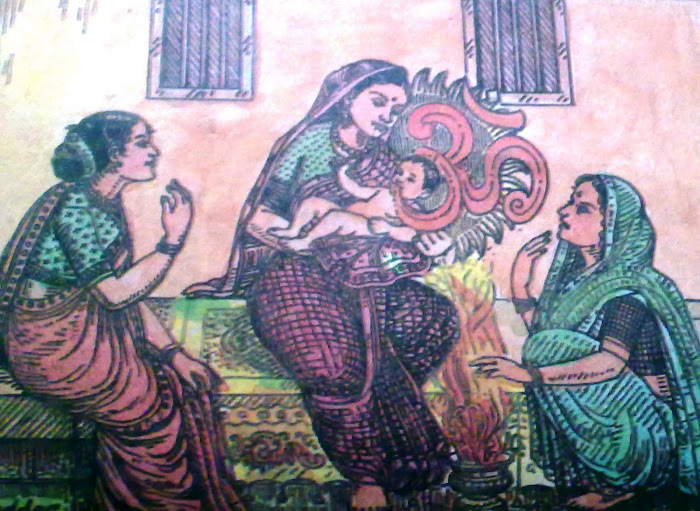 This Adhyay illustrates the power of chastity ie, purity as exemplified in the life of Anasuya. Her purity could transform the great Trinity (the Durlabhya, i.e., the unattainable) into mere babies in her arms and make them (Saulabhya i.e., brought them within one's easy and close reach). The name Atri means one who has transcended the three Gunas. Anasuya is one who is bereft of human frailities such as jealously etc, and is spotlessly pure, where 'Atri' and 'Anasuya' co-habit, Lord Himself is also sure to abide). Adhyay 5 - The Birth of Shripada Shri Vallabha. 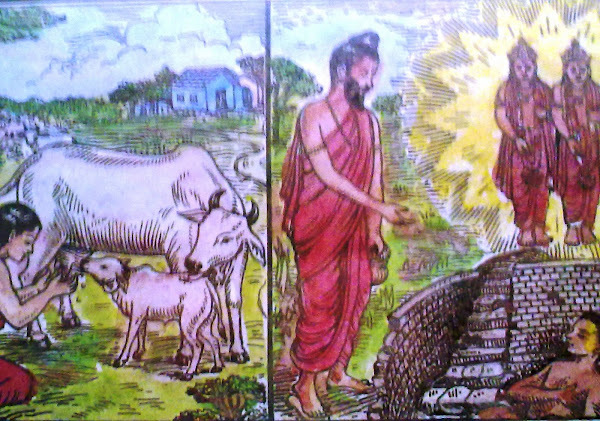 Shri Dattatreya (In Disguise) Came to a House of a Brahmin called Appalraj at Peethapur for Begging Alms.It was an Amavasya Day and there was Anniversary Ceremony Day at their Home.Even then Sumati (Apalrajs wife) offered Alms to the Lord.The Lord being Pleased asked her wishes and said her that he will Incarnate as her Son. This Made Lord Dattatreya to Incarnate as Shripad Shri Vallabha. Shripada ShriVallabha sets out on his divine mission at a early age, after curing his lame and blind brothers and blessing the household with endless prosperity. This Adhyay describes the birth of Gokarna Mahakshetra. Ravana Sees his Mother Kaikaya Performing Pooja of a Shivlinga and Says her that he will bring Kailasa itself to her.Ravana went to Kailasa and Started Shaking it with his 20 Hands.Parvati Prayed Lord Shiva to Protect Everyone and Lord Shiva Pressed Ravana Underneath the Kailasa.Ravana then Performed Ugra Tapasya.Lord Shiva was Pleased and he gave his Atma Linga to Ravana and asked him not to Keep it on the Earth on the Way. Shri Vishnu Sends his Sudarshan Chakra to Hide the Sun and asked Narada Muni to go to Ravana and Induce him to Linger on the Way,as he would like to Observe Evening Sandhya.Then Shri Vishnu Calls Ganesha and Says him to go to Ravana in the Disguise of a Brahmachari Child,Win his Confidence and Keep the Linga on the Earth.Shri Ganesha did Likewise and Kept the Atma Linga on the Earth when Ravana had been for Sandhya.Ravana Returns and Slaps Ganesha and Ganesha in a Crying Tone leaves from there and Comes back to Kailasa. Adhyay 7 - Importance of the Kshetra Gokarna. This Adhyay describes the Gokarna Kshetra Mahatmya. A visit to this Holy Place burns off all sins however, much grievance they be and earns for the person Kailasha-Pada. 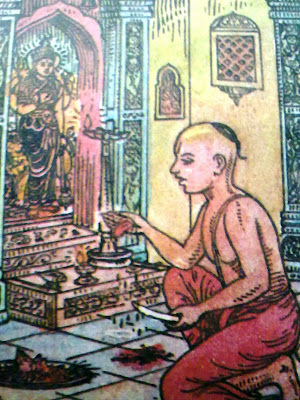 Gautama Rishi narrates to the King of Ikshawaku Family who was under a curse by a Brahmin Women (while living as a Brahma Rakshasa as cursed by Shri Vashishta), how a Chandala woman, with sins galore on her head, earns Kailasha-pada by the mere coincidence of her dying at the Holy Gokarna. Gokarna had so much sanctity that Sripada SriVallabha chose to visit and spend 3 years there. (The term 'Chandala', in a sense, is our 'Deha-buddhi', i.e., obsession with the idea that 'I am the body'. 'Shiva-Linga' signifies the 'Atma-buddhi' or Sivoham-Bhavana', i.e., the understanding that one is not the body but the Spirit. From 'Deha-buddhi', we have to raise ourselves to 'Atma-buddhi', then we will have earned the 'Kailasha-Pada'). Adhyay 8 - Importance of the Shani Pradosha Vrata. In this Adhyay, Sri Vallabha teaches about Shani Pradosha Puja Mahima to Ambika, who in a state of desperation, came to the river with the intention of drowning herself along with her blockhead son. He narrates how a shepard-woman was born as Yashoda in her next life through the merit earned by mere seeing of the Shani Pradosha Puja, and became the (foster) mother of Lord Sri Krishna. Sripada SriVallbha blessed the blockheaded son of Ambika and endowed him with all Sastraic knowledge & wisdom and blessed Ambika that he would Reincarnate as her son in her Next Birth as Shri Narasimha Saraswati. In this Adhyay is also described the emergence of Maha Kaleshwar Jyotirlinga as a result of the Shani Pradosha Puja done with deep devotion by the Shepard boy. 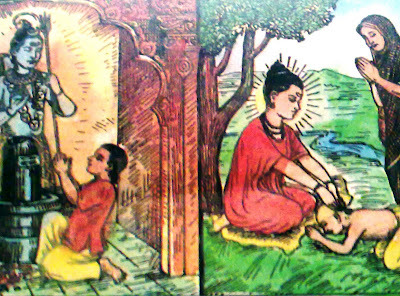 Adhyay 9 - Shripad Shri Vallabha blesses Rajak to be a king and eventually ends his Avatar. 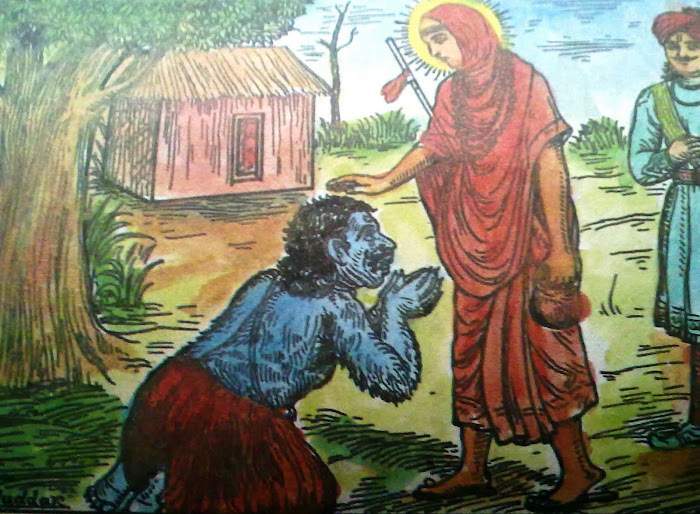 Shripada Shri Vallabha gives boon to the Rajak (Washerman)-devotee that he would be born in a Nawab Family and be ruler in his next birth and would also have his Darshan but in his Next Avatar (i.e., when he would reappear as Sri Guru Narasimha Saraswati) and eventually ended his Avatar. 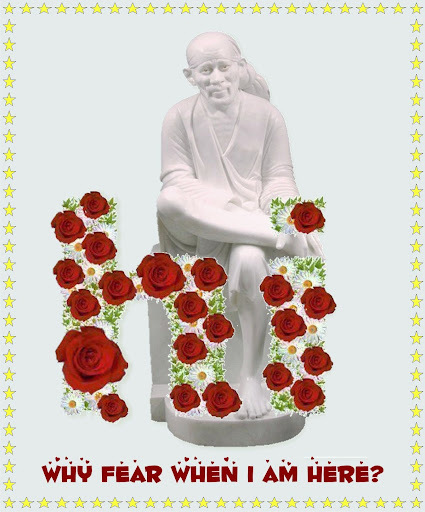 Sripada SriVallabha's continued showering of His Grace on his devotees even after his Mahaprasthan. In this Adhyay, and account is given of how Sripada SriVallabha, even after the withdrawal of His Avatar (ie., even after the Mahaprasthan), continues to manifest and shower his grace on his devotees. 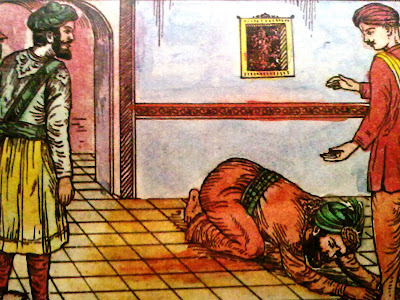 An illustration is given how Sripada SriVallabha protected a Brahmin-devotee by bringing him back to life after he was killed by dacoits. The same grace continues to be showered even now, on whomsoever seeks it. In this Adhyay is described the advent of Sri Narasimha Saraswati. He was born as a son to Shri Madhava and Amba in Lad Karanja as per the promise given to her in her previous life (as Ambika) by Shripada Shri Vallabha. At birth, he was uttering 'OM!' 'OM!' 'OM!'. He was otherwise 'dumb' till his Upanayanam was performed. With Upanayanam, he bursts into recital of Vedic Mantra and begins to glow with all knowledge and wisdom. 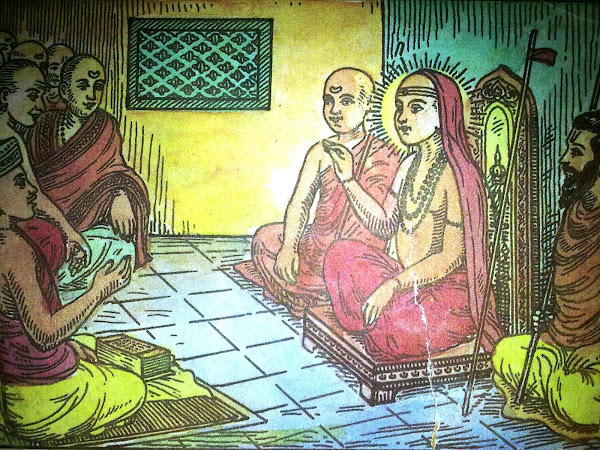 Adhyay 12 - Shri Narahari taking to Sannyasa and becomes Shri Narasimha Saraswati. 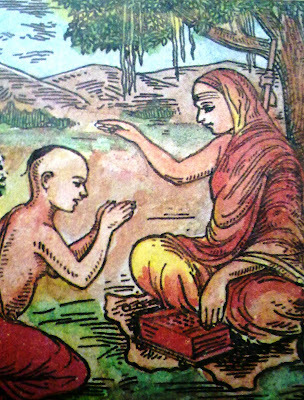 In this Adhyay Narahari gives spiritual instruction to his mother; he blesses her that she would have two more sons within a year and one more son and daughter later. After birth of the two sons (twins) he leaves home for Kashi. He was hardly 9 years of age at that time. At Kashi, he took initiation into Sanyasa Asrama from Shri Krishna Saraswati of the Shringeri ( One of Shri Adi Shankaracharya Peethas ) Linage and took the name of Shri Narasimha Saraswati. After that he went to Badarikashram and visited many holy places. Adhyay 13 - Shri Guru Narasimha Saraswati cures the Chronic Stomach ulcer of a Brahmin. 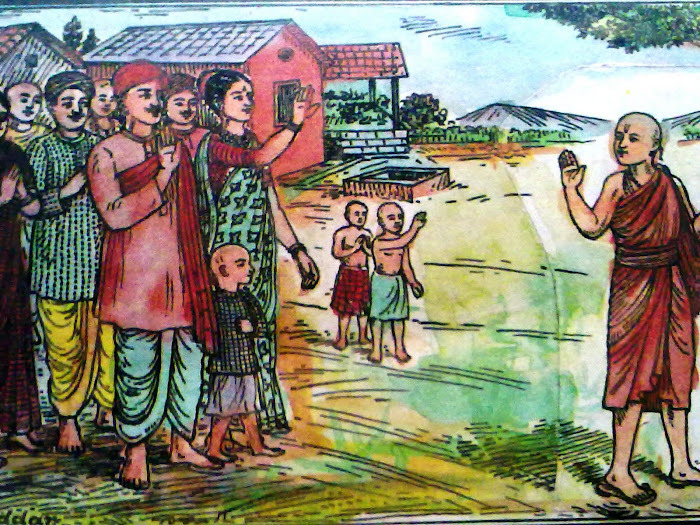 In this Adhyay is described the visit of Guru Nath along with his disciples to his parents at Karanja. From there he again sets out on his itinerary. At Basar Bramheswar, Guru Nath cures the chronic stomach ulcer of a Brahmin, who was about to kill himself, being unable to bear the excruciating pain of the ulcer. Shri Guru Narasimha Saraswati rescuing the life of Sayamdeo by His Grace. In this Adhyay, is described how Sayamdeo, the village officer in Basar Bramheshwar who is Saraswati Gangadhar's (Namdharak) great-great-Grandfather, was protected by Guru Nath from being killed by the Muslim Nawab. Adhyay 15 - The Holy Pilgrimage places of Bharata described by Shri Guru. In this Adhyay is described Guru Nath's instructions to his disciples regarding the merits of doing pilgrimages and which of the places they will have unfailingly visit. After sending most of his disciples on pilgrimage, Guru Nath lives in seclusion (invisible to others) at Vaijnath. The Siddha Yogi was the only disciple who was retained by Guru Nath with him at Vaijnath. (The mere study of this Adhyay with faith and devotion, is believed to confer upon the reader the very merit of doing the pilgrimages himself). Adhyay 16 - The Fruits of Devotion to the Guru. 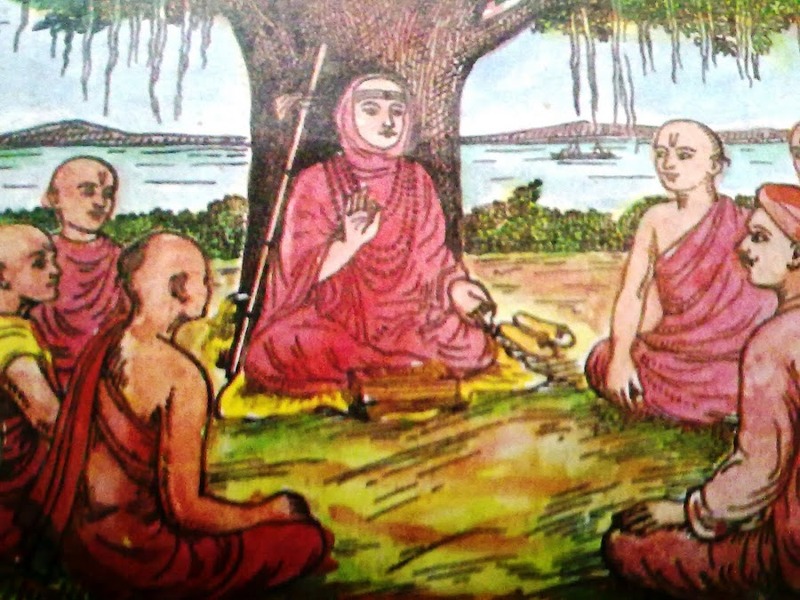 In this Adhyay, Guru Nath narrates to a Brahmin about the necessity of single point devotion to the Guru and the merit of Guru Seva, by way of illustration of the anecdote of Dhaumya Rishi and his disciples namely Arun, Baida and Upamanya. Unless Guru is pleased, the doors of knowledge will not be opened to the student/aspirant. Guru Nath now comes to Bhillawadi (Bhuvaneshwari Kshetra) on the eastern bank of river Krishna. He stays there for four months (Chaturmasya - the four months of the monsoon season), under the Audumber Tree on the western side of Krishna river. The Blockheaded Youth becomes a great Pandit. A Dull Brahmin Boy Comes To Bhillavadi and Prays Goddess Bhuvaneshwari by Cutting his tongue and Placing it at the feet of the Goddess.Thus Prays for making him Knowledgable.Goddess Bhuvaneshwari instructs him in his dream to go to Shri Guru at Audumbar. 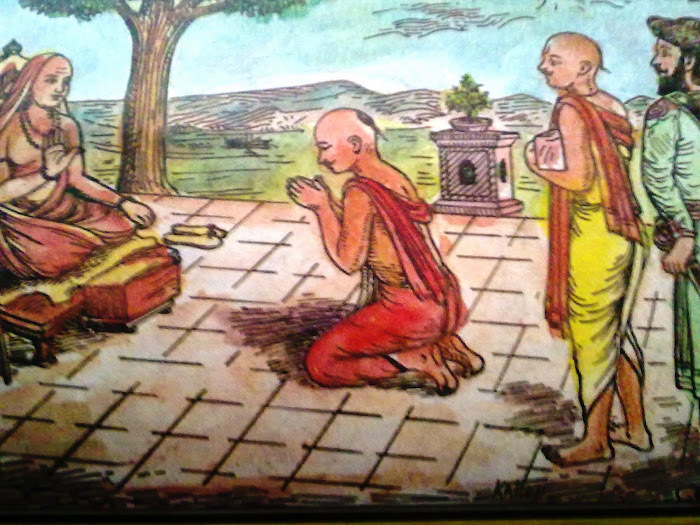 The Illiterate Brahmin Comes to Audumbar and Bows in front of Shri Guru.Shri Guru blesses the brahmin and he becomes Knowledgable. Page created in 0.602 seconds with 69 queries.